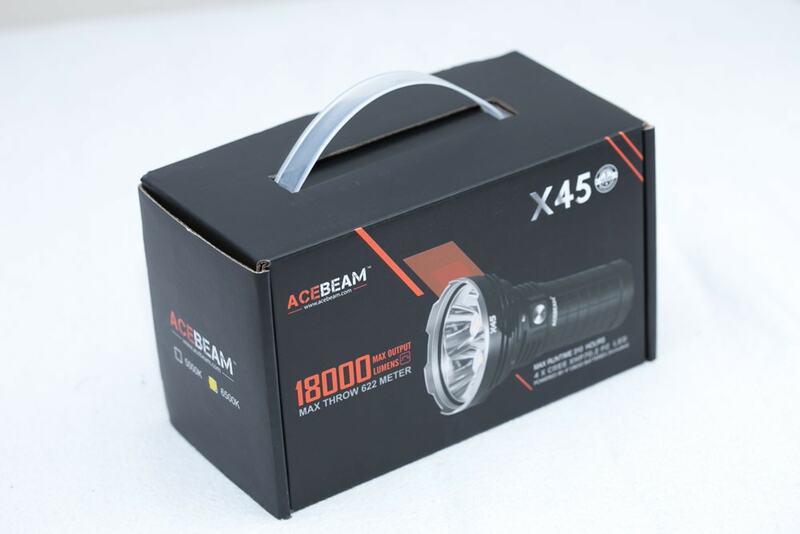 The Acebeam X45 gen 1 was originally launched in 2017, and now upgraded with the latest XHP70.2 extra high power LEDs. 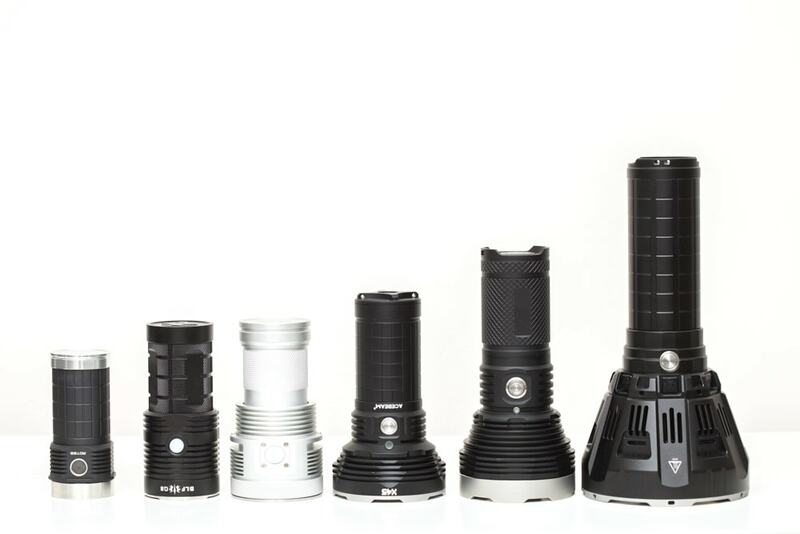 The updated version is claiming a max output of 18.000 lumens while the first generation was claiming 16500 lumens. Not so much of a difference. The other difference is the reflector. On the first generation it included an orange peel reflector for flood while the 2nd generation uses smooth reflectors. Another difference is the driverboard that is currently gold colored, the same as the battery carrier. Last year we reviewed the Acebeam K65 which is a great all-rounder. 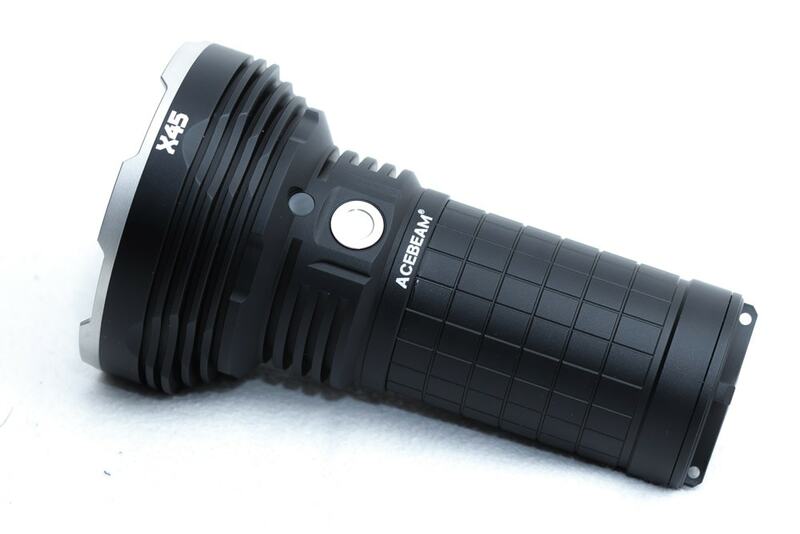 This time we will review the Acebeam X45, which actually is a little older than the K65, but way more powerful. The X45 is supposed to do 18,0000 lulmens. 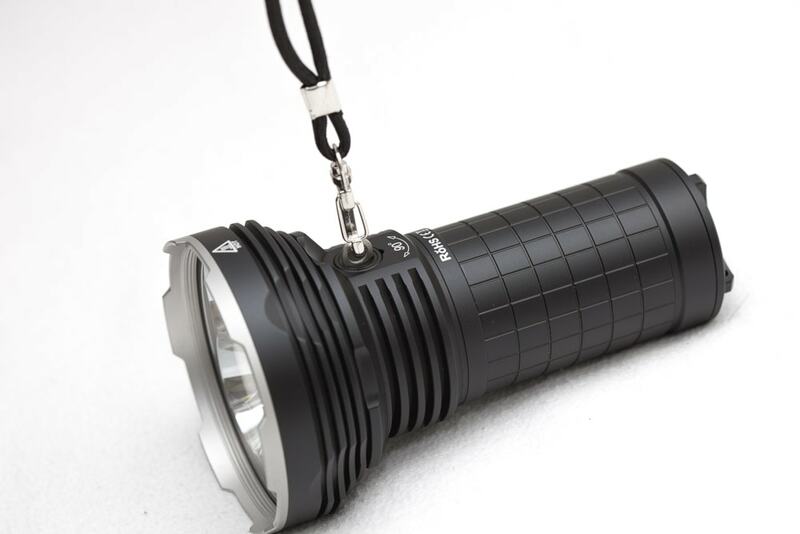 It's much smaller but at the same time includes 4 XHP70.2 LED diodes instead of 1! I can hold the X45 very comfortably in my hands. It balances very well, and doesn't have any weight pushing it down either on the front nor on the back. 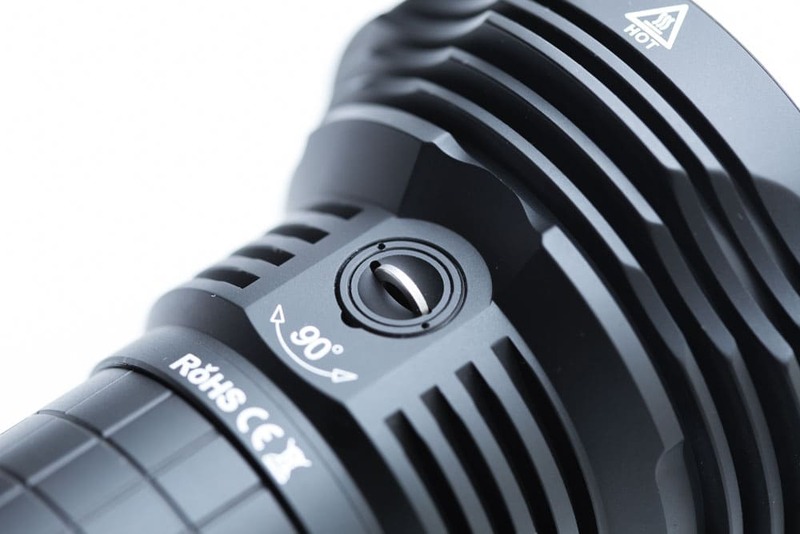 This is probably because the head isn't as big as the Astrolux MF04, BLF GT or the Imalent MS12 we reviewed earlier. 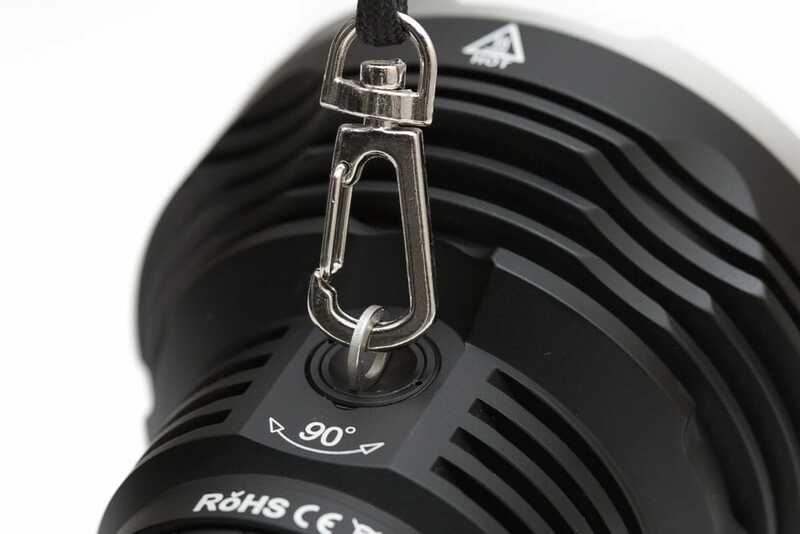 The switch is easy to find in darkness, unlike the Imalent MS12, because the switch is located on the opposite side of the attachment ring for your carrying strap. A nice little feature is that you have to push and twist the ring so it pops out! Unfortunately it doesn't have a tripod attachment! 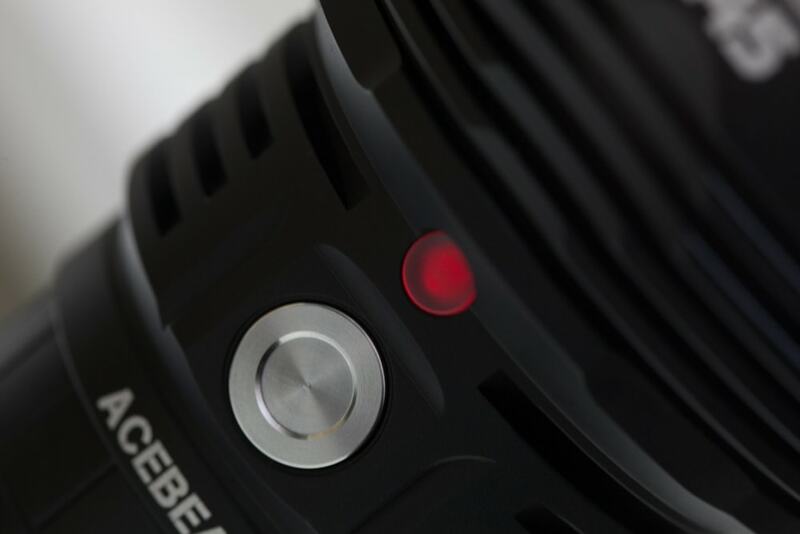 After using the X45 on Turbo the whole body heats up and fortunately the light drops in output to reduce the vast amount of heat it generates! Yes it can defenitely tailstand. But there aren't many... or any... diffusers that would fit the size of the bezel! 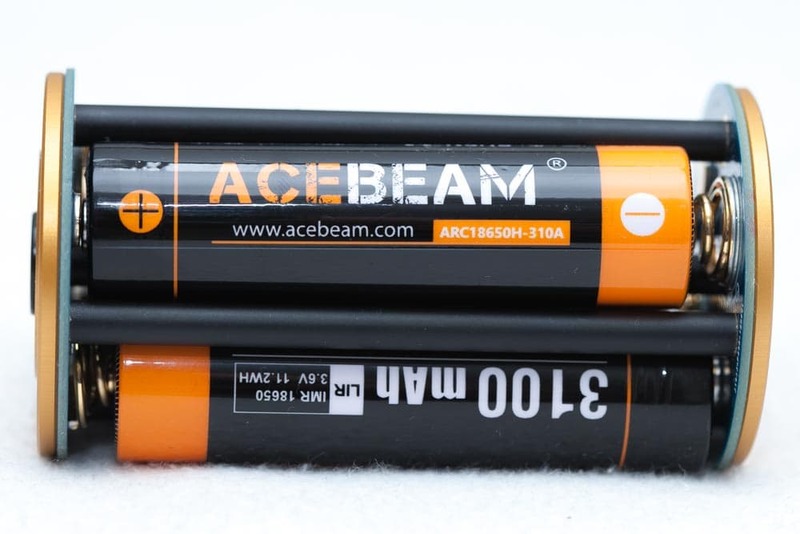 Like with all acebeam products, build quality and anodization is perfect. There is no blemish to be found anywhere. The machining was done very well and there are no sharp edges anywhere on the light. 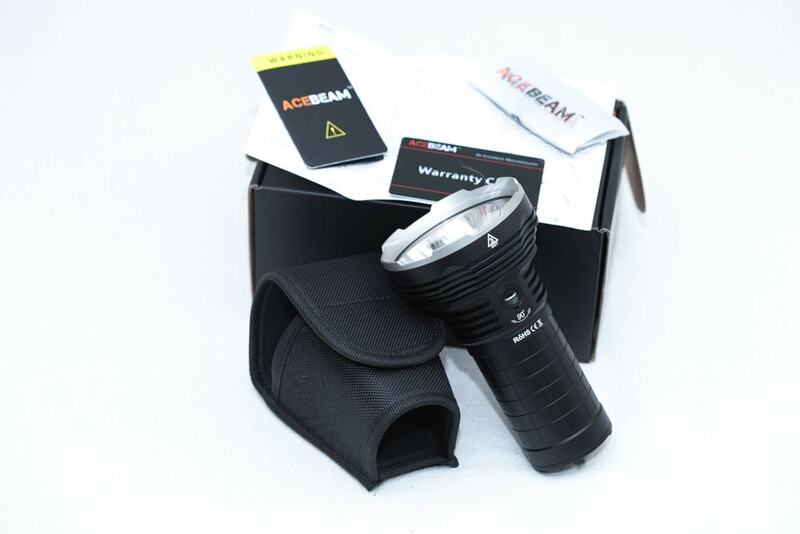 Acebeam is definitely one of the top flashlight manufacturers! Both threads and o-rings came lubed. 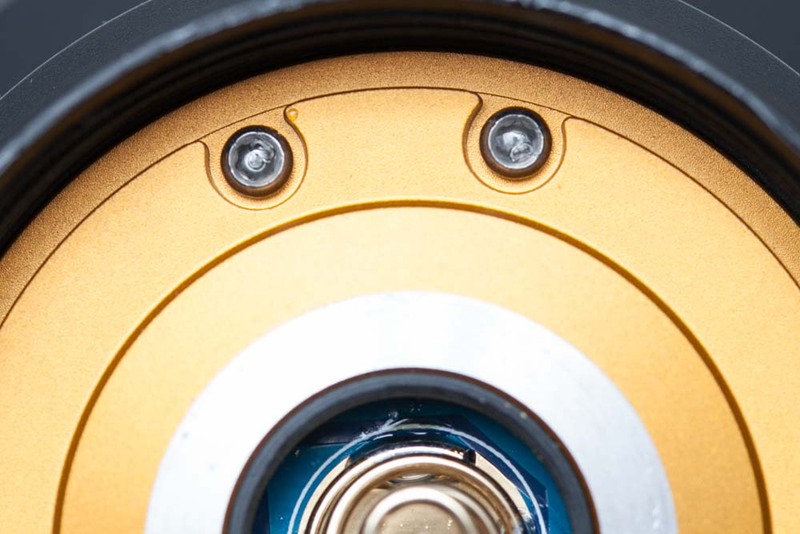 In the following picture you can see that there is 1 O-ring on the flashlight body, and enough lube on the threads. 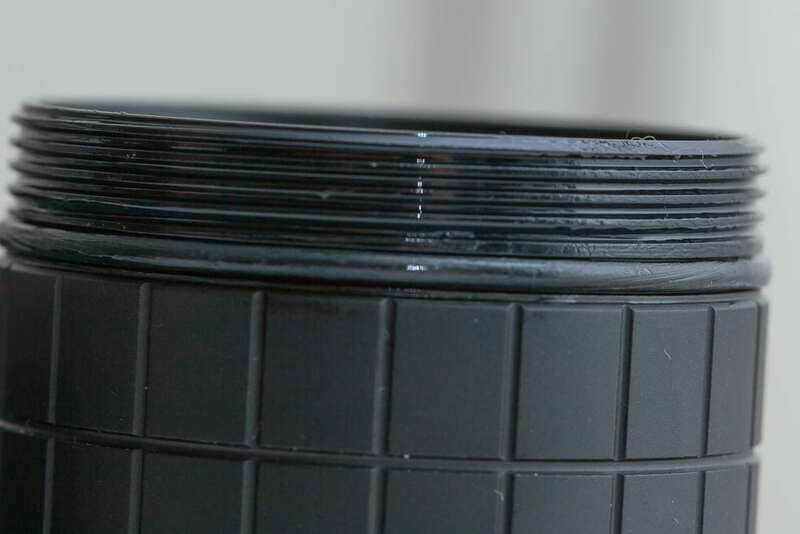 The threads are not squeeky, and work very smoothly. Although claiming IPX8 water resistant, I would personally not use it underwater by any means. Rain should have no impact on this bad boy! Plus, you'll get an extra pair of O-rings just in case. Now it starts to get interesting. 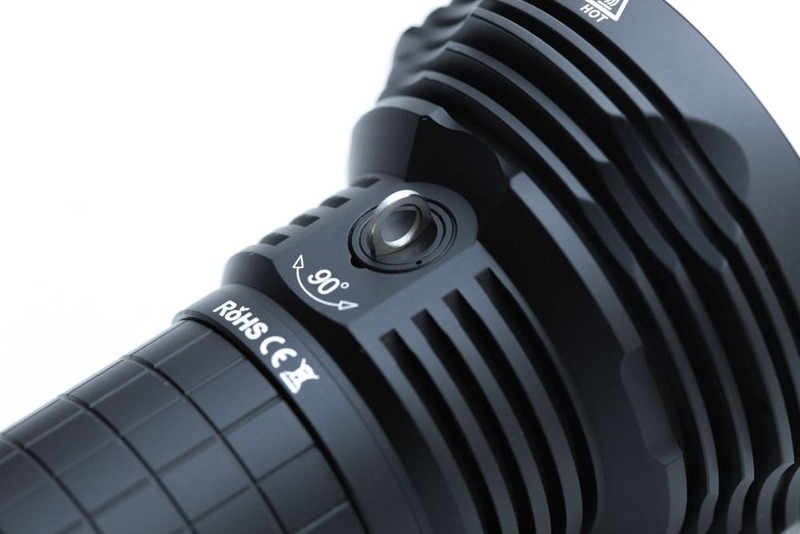 The Acebeam X45 is a beast and good looking at the same time. 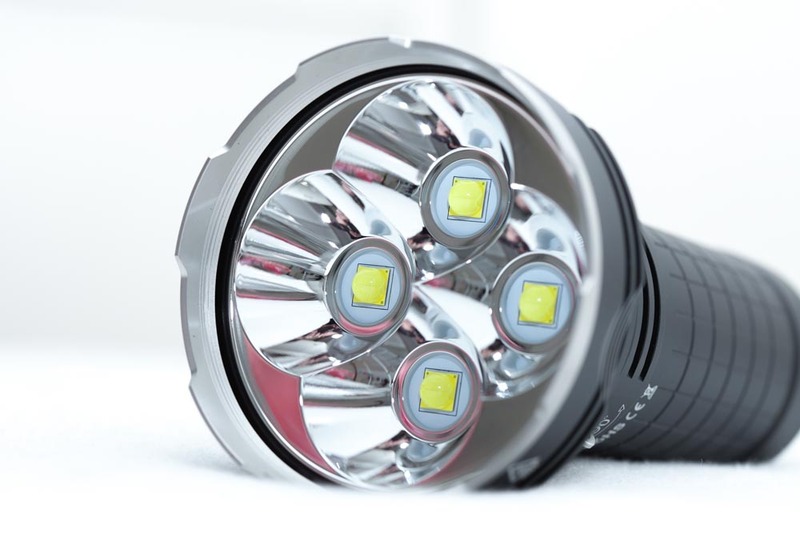 The LED diodes used in this light are 4 pieces of CREE XHP70.2 which are beatifully alligned in the reflectors. The tint is on the cool to neutral side. The reflectors are smooth so they will help reaching the beam as far as possible. It's supposed to throw almost 100Kcd... and we will see if they can actually reach that! Read on! Note: the manual included with the light has a mistake in it. It mentions the peak beam intensity being 96569cd, but the Acebeam website says it's actually 109000cd. While the 1st generation X45 was supposed to be 85200cd. So I don't really know why the manual mentions 96569cd!!!?? The Lens is clear and has some kind of coating. The manual says it's Ultra-clear tempered glass lens with anti reflective coating... there you go. The bezel however is not removable, nor is the driver removable. Please take a look at the picture of the driver board. You will notice there is some kind of glue added to the screws. This way they make it impossible to open. Head diameter: 88 mm / 3.46"
Width body : 50 mm / 1.96"
Weight including batteries : 708 gr / 1.56 lb. 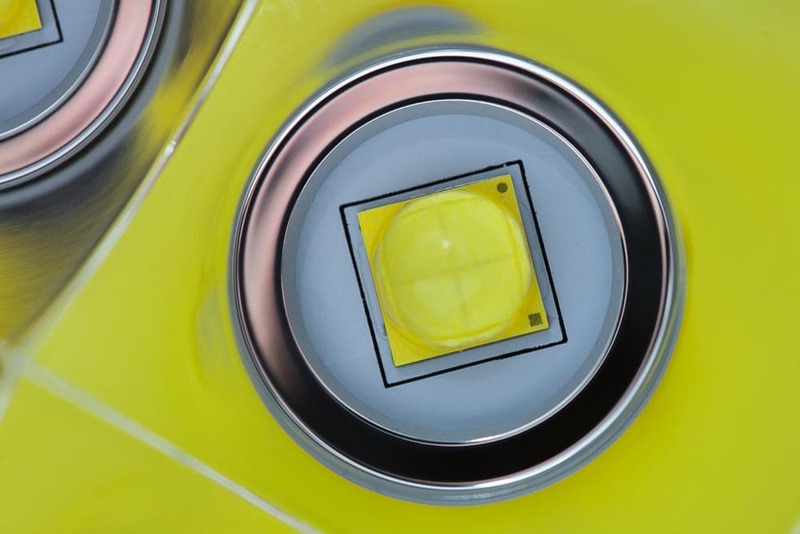 The light has 3 main modes, Low, Medium High, but beside these main modes, it also includes a Firefly, Turbo and a Turbo Max mode. It does have mode memory, but not for Firefly, Turbo or Turbo max! Yes, it does have strobe, and is supposed to be with 5000 lumens. Triple click from either On or Off will give you Strobe. There is no Beacon or SOS. You can enter this mode by press+hold the switch for about 4 seconds. The light will blink twice and then enter Lock Out Mode. To return to normal functionality just press and hold again for 4 seconds! when the light is off. 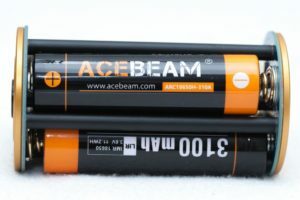 The Acebeam X45 comes with 4 High Amp batteries included. These batteries are labeled ARC18650H-310A. The last part is a little strange because other manufacturers usually include the Max draw of the battery, which is usually somewhere between 5-30A (whenever they mention Amps). 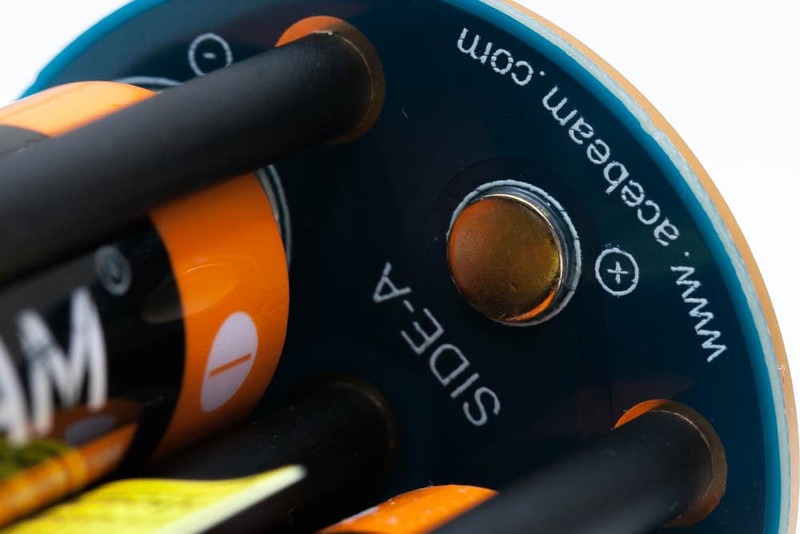 They also mention "The voltage of full charge and sicahrge is 4.2V and 2.5V". And during the runtime test, the batteries went really down to 2.5Volts. This is a little strange, since the working Voltage should be between 12V to 16.8V.. and 4*2.5 Volts is actually 10Volts... so in my opinion it should had switched off by itself to protect the batteries from a deep-discharge. My integraged Sphere only measures up till about 4000 Lumens, and anything above this is difficult to measure consistantly. I tried using a Neutral Density filter that I use for my Canon DSLR Camera, but the numbers didn't add up. I made the hole wider so the bigger powerhouses can be measured as well, in lower modes at least. I used the professional Hagner E4-X for measurements. Turbo and Turbo Max couldnt be measure since the Lux Meter gives an error. 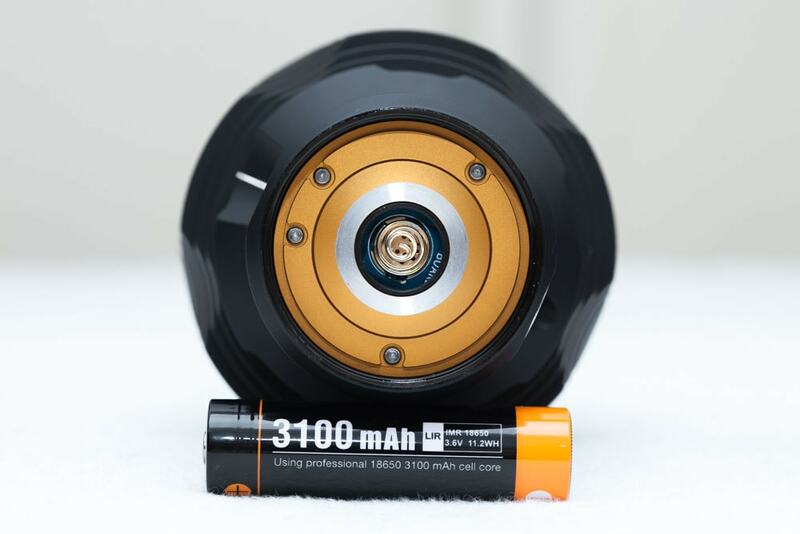 The runtime was done with the included High Amp 3100 mAh 18650 batteries, without cooling. On top of my desk. As can be seen in the graph. Turbo mode lasts about 2.5 minutes and from 4 minutes onwards it's at 24% output, this lasts till about 74 minutes when the light slowly drops in output. I quit the runtime test when the light was at about 1% output. This is NOT RECOMMENDED. 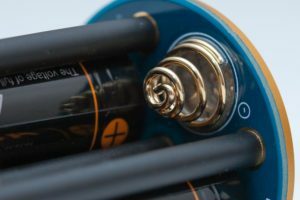 Since the batteries were discharged to 2.5 Volts. Although the batteries say this is fine, I would recommend switching the light off when the red LED indicator starts blinking! Since this light is such a beast I have to be careful measuring the throw in my garden. These measurements were taken at a 10 meter distance. Total throw measured at 10 meters in Turbo Max mode: 101600cd or in other words 102kcd. The throw numbers seem to be about the same as Acebeam claims! So that is a pro. 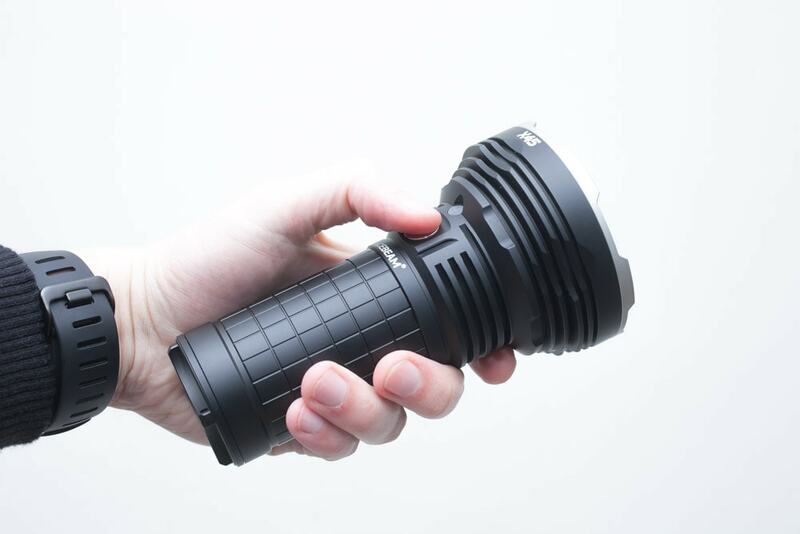 Disclaimer: The Acebeam X45 was provided by Nitetorch for review. Before receiving it I wasn't overly excited like I am with some other lights, but boy this thing is really awesome. I am really impressed. 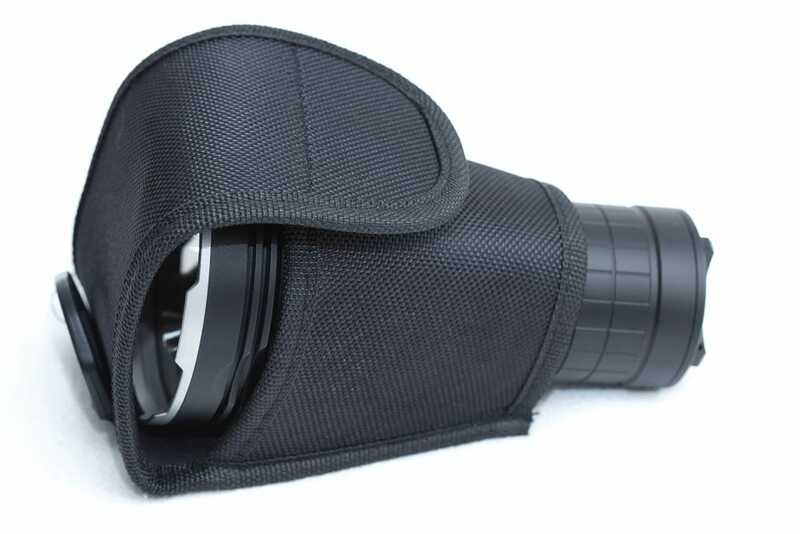 It's very bright, easy to hold, and at a very comfortable size! I actually like this one very very much. 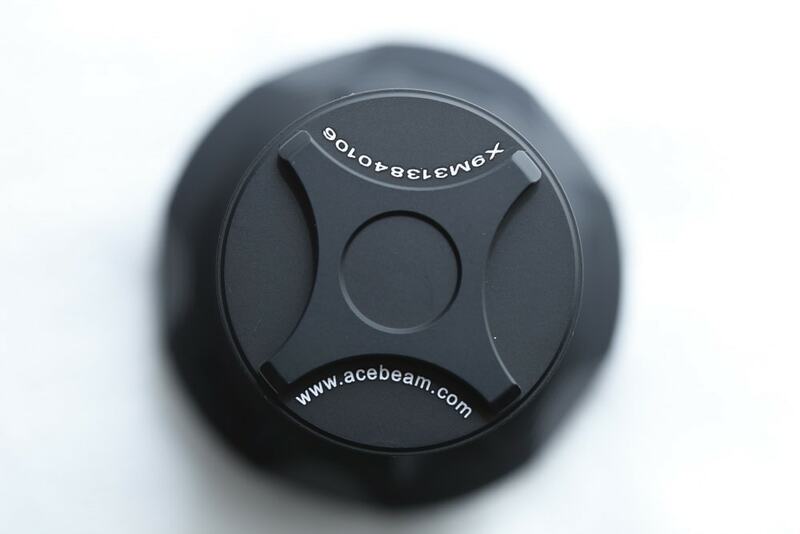 If you want something not too heavy, easy to hold, has a simple UI and very bright.... You should really consider the Acebeam X45!! !